It’s that time of year again… As we flick the calendar over to September, we have little to look forward to but dark nights and plunging temperatures, right? Wrong – we have plenty of new beauty trends to get excited about. And this season, there are some really easy, wearable trends that we can all try at home – with a little help from our favourite beauty products, of course! As seen at: Etro, Gucci, and Nicole Farhi. This has to be one of the strongest makeup trends for the season ahead. 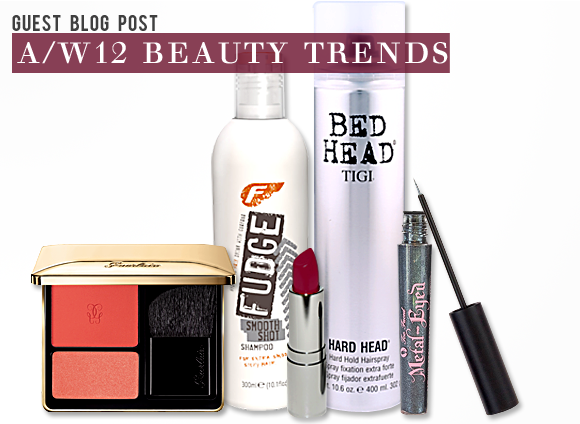 If it’s the deepest, darkest shade of red or plum, it should be in your makeup bag this season. Kit: Daniel Sandler Micro-Bubble Lipstick in Berry, £9.28. As seen at: Dolce & Gabbana, Missoni, Missoni, and Vera Wang. This trend is all about natural, but enhanced brows. Don’t over-pluck them, but let them take their natural shape and define with a brow pencil. Kit: Clarins Eyebrow Pencil and Brush, £12.80. As seen at: Mary Katrantzou and Louis Vuitton. Top knots are back! Whether it’s a messy, dishevelled look for weekends or a sleek look for days in the office. Just make sure you have plenty of hairspray to keep the style in place. Kit: TIGI Bed Head Hard Head Hairspray, £7.80. As seen at: Erdem, Giorgio Armani, Lanvin, and Moschino. Forget subtle, perfectly applied liner – and get creative with thick lines, big flicks, metallic finishes, and bold colour. Kit: Too Faced Metal Eyed Liners in Blackout, Twilight, Get Lucky, Plum Crazy or Brown Sugar, from £9.80 each. When it comes to blusher, a soft and very pretty rose pink is the way to go for the season ahead. Hold back on the application – one sweep across each cheekbone is just enough. Kit: Guerlain Rose Aux Joues Blush Duo, £26.55. This is probably the easiest trend to pull off – but make sure you keep hair sleek and healthy with a hydrating shampoo and smoothing serum. Kit: Fudge Smooth Shot Shampoo, £6.45, and TIGI Bed Head Candy Fixation Glaze Haze Smoothing Serum, £8.40. I purchased this lipstick on a total whim. I have never used Daniel Sandler before and am a bit of a newbie to lipstick in general having been a gloss or lipsalve girl before, but I was looking for a change and wanted to step into the more grown up world of full on lippie. This is not for the feint hearted. It is bold and powerful, but the most amazing scarlet red I have come across - the type you see in magazines but never manage find the in the shops. Very Jerry Hall. Good lasting power and most amazingly to me, as I have never found this with lipstick before - it does not dry out or make my lips flaky. Brilliant. Worth a go. Would recommend a lipliner to go with. FYI I have blonde hair, blue eyes and pale skin with a yellow undertone. This entry was posted on Monday, September 3rd, 2012 at 9:06 am and is filed under Guest bloggers, Haircare, Make-up. You can follow any responses to this entry through the RSS 2.0 feed. You can skip to the end and leave a response. Pinging is currently not allowed.